Rare gulf-front home offering in ultra-exclusive Four Mile Village. Near Grand Boulevard's best shops and restaurants, there is a little-known, peaceful community thriving with canopied oaks, relic sand dunes, and 2200 ft of quiet beaches. Established in 1941 as a ''place of peace, a place of quiet,'' this legacy continues today. Located within the 350-acre Coffeen Nature Preserve, surroundings and beaches are unspoiled and private. 191 Beach Drive sits high over unharmed dunes overlooking its extremely rare 130' of beach front. 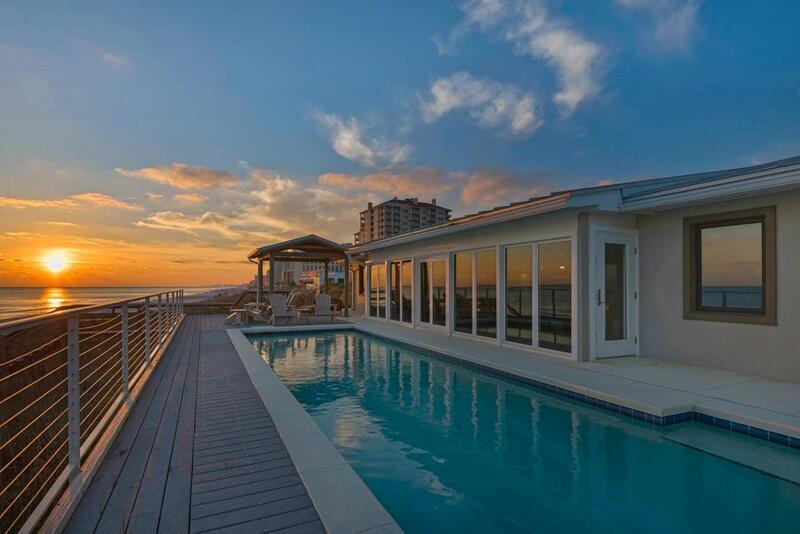 Beachside, a 44 ft heated pool is anchored on 6-foot steel pilings overlooking 3 seawalls. Inside, envision a relaxed, retro modern aesthetic. The remodeled kitchen features stainless counters and high-end appliances including Sub Zero Refrigerator,Sub Zero double drawer freezer, DCS by Fisher Paykel double ovens, gas stove top and double drawer dishwasher. The kitchen overlooks a large living/dining area with tiled floors and an impressive fireplace. A split floor plan with 5 BRs and 5 BAs ensures privacy. An enclosed Florida room with floor to ceiling windows and electronic shades overlooks the pool and miles of beaches. Reminiscent of old Florida, Four Mile's gated compound of only 37 homes offers a 50-acre private lake, hiking trails, natural foliage, and frequent wild-life. Well-qualified buyers are invited to arrange a private showing.